artistsadek at gmail com . Sadek Rahim holds a Visual Arts MA from the Central Saint Martins School of Art and Design in London and a BA from The Lebanese Fine Arts Academy in Beirut. He returned from the UK to Algeria in 2004. Central to Sadek's work is a social awareness and commitment to highlighting social problems such as the issue of illegal immigration. His work, Facing Horizons, commissioned for an exhibition about Yves Saint Laurent in 2013, is composed of stickers that display portraits of young Algerian men. “Everywhere I go, I take pictures. I like engaging with young people in the streets. They always talk about going away, trying their luck. When I am sure one of them is a potential immigrant, I take a photograph.… ” Sadek Rahim is also the co-founder of the Contemporary Art Biennale and the First Salon for Contemporary Drawings in Oran, in collaboration with the local organization CIV-oeil. Concerning his engagement with cultural politics the artist has expressed his commitment to the contemporary art and of Algeria and to promoting an awareness of contemporary Algerian art and culture internationally. He also curated and co-curated events like 'Nuit Blanche Oran' and ‘Video’Appart-Oran'. 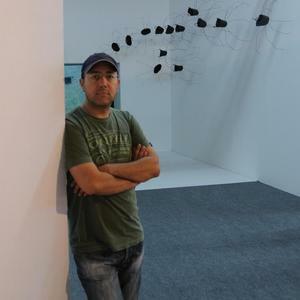 Sadek has exhibited in many contemporary art spaces and Museums all around the world. The work of Sadek Rahim often combines photography and installation, technology and design. He has shown his work widely following his thesis project at Central Saint Martin's in London. He has been the inaugural artist of the Eclosion Gallery in Oran. Sadek has exhibited in many contemporary art spaces, including Art Dubai, Dak'Art, SWAB Art Fair, The Museum of Contemporary Art MAMA Algiers, The National Museum Zabana in Oran, The Montparnasse Museum, Nuit Blanche Paris, The Mamia Bretesche and The TalmArt gallerys in Paris, The Brick Lane Gallery, The Mosaic Rooms and The Oxford House in London UK, the Busan Museum in Séoul and The Alserkal Foundation in Dubai, the French Alliance in Buenos Aires and in many other countries. Recently Sadek Rahim has been chosen with Samta Benyahia (Algerian-born French artist) to be the two artists invited to showcase their work during the international event "˜'First Night Oran'' curated by Jérome Sans.